A black leather/fabric dress transferred black dye to my long white faux leather coat. The tag says 100% polyester. I've tried vinegar, baking soda, Dawn, Tide, Carbona Stain Devils #2 and #8, but nothing works to remove the black stain. I could use any recommendations please. You might try Magic Eraser but be sure to be very gentle as "scrubbing" might damage your coat. Looks like you have tried many of the products/solutions recommended for faux leather so the dye must really be a tough one. I believe you may be reading the tag incorrectly as faux leather cannot be 100% polyester but it can have a polyester "backing" or a polyester lining. Please search for another tag just to be sure. I have had some luck with using an alcohol/water mix but only limited success. Here are a couple of links that have several suggestions that might help with your stain. Whatever you use (and you successfully remove the stain) be sure to condition it with some type of leather/faux leather conditioner or your coat may dry out and start to crack in places. Here is a product that I have used and it worked for me and it is a cleaner and conditioner. Here is a cleaner that I have used (for different things) and it also worked but your stain may be too tough for even this product. I found the jacket on Posh, here is the description, it states polyurethane and polyester. Thank you for the links. I don't know if it worth continuing to buy more products to try to clean it. I already purchased saddle soap, etc. As a last resort before you give up, I have had moderate luck with hair spray removing ink on cottons and cotton poly blends. Spray just a tiny bit in a corner/edge of the stain and see if it removes (or makes the stain lighter). When using hairspray, lay the garment on a clean, dry surface (nothing porous, not the bed etc...but a hard surface like a ceramic kitchen counter or tile floor in the bathroom) (even the ceramic toilet top can work in a pinch). Be sure that only the piece affected is getting wet with the spray. 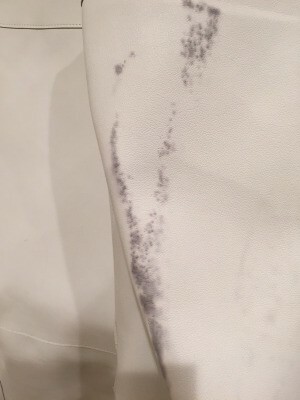 I learned the hard way that if you have the spot side and other side touching when the hair spray hits it and can transfer the stain to another place on the item OR another item...like a bed sheet (YIKES). If you see it moving the stain, keep spraying more, blotting with a clean white hanky or other white cotton rag. Try not to rub as it makes it worse...blot to transfer the stain to the rag until it is all gone. If it comes clean, wash in cold water after (in a regular load). What a shame - that looks like a really nice coat. The label says washable so why not give that a try before giving up? Washing (never put in dryer) may remove the stain since you have applied some of the other solutions. Hope something works but it does seem this type of material is prone to picking up colors from other items. Just a comment: one of the products mentioned is really great for any kind of stain so it would not be money spent for just that mark on your coat. Good luck and I hope something works. is it possible to have a seamstress redo the coat by cutting out the part with the stain and resewing the coat? or is it possible to somehow intentionally create an artistic statement by having an artist (or doing it yourself) paint a cool flower design with fabric paint? Thank you I will try hairspray, I had forgotten about that trick. Unfortunately the stain is all over the back, sides and arms. a total bust. RE: the 2 products that were mentioned in the earlier post, you or the other person said its a really good product for stains in general.